(Bloomberg) -- The cost to create the world’s largest gold company: A 17 percent premium for a $10 billion all-shares acquisition that faces some big-time challenges down the line. But at the same time, "Newmont has some difficult times ahead with drastic surgery needed at Goldcorp,” according to John Ing, an analyst at Maison Placements Canada. “In the short term and medium term, the deal is not good for Newmont,” Ing said in an interview with Bloomberg News on Monday. Newmont has said it intends to shed as much as $1.5 billion in assets over the next two years. Likely targets would be Red Lake, Musselwhite and Porcupine from Goldcorp’s mines and possibly Newmont’s Ghana’s mines, according to Walker. While the premium overvalues the quality of Goldcorp’s asset, the value will return to Newmont’s stock if it "shows it can manage those assets over time," said Joseph Foster, a New York-based portfolio manager at VanEck International Investors, by telephone. Hours after announcing a deal, Gary Goldberg, Newmont’s outgoing chief executive officer, said he’s already fielding calls from miners interested in buying any assets he may be willing to sell. “I’ve had lots of inbound calls today from different folks who have interest in different assets, so I know there’s lots of interest out there,” Goldberg told analyst in a conference call. Newmont will go through detailed process to determine which assets it intends to sell and to prioritize projects to advance, he said. The deal reflects a pressing need in the industry to achieve greater cost efficiencies, said Dan Denbow, a senior portfolio manager at USAA Asset Management Co.
“For the larger companies, they are feeling pressure due to lack of success with the drill bit and the Randgold-Barrick merger,” Denbow said. "‘There is a consolidation drive at all levels of the business running from asset level, merger of equals of small to intermediate companies to the mega merger. All trying to get synergies in overhead, access to capital and relevance with investors." Tom Palmer, the incoming head of the merged company, is a relative newcomer to the gold space but has decades of experience in the mining world, including more than 20 years with Rio Tinto Group. He’ll take over the reins of of a company capable of producing six to seven million ounces of gold for decades, even after it sheds assets. Goldberg, the current Newmont CEO, is expected to retire by the end of 2019, after seeing through the transition which is expected to be “substantially completed” in the fourth quarter of 2019, the companies said in a joint statement. Current chairwoman Noreen Doyle will retain her position in the merged company. 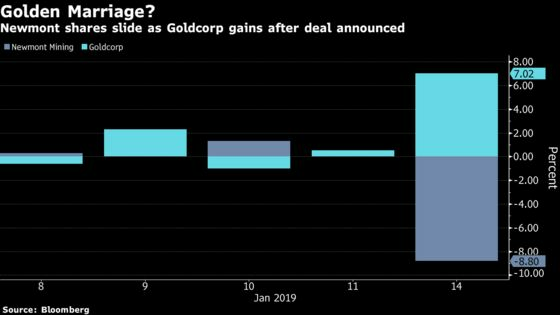 “The problem for Goldcorp is they overpromised and underdelivered,” said Andrew Cosgrove, an analyst with Bloomberg Intelligence. Newmont is "going to have to prove that they can ride the ship on the Goldcorp asset base."